Anya's husband, a submariner, has died at sea, leaving Anya alone with her baby daughter. 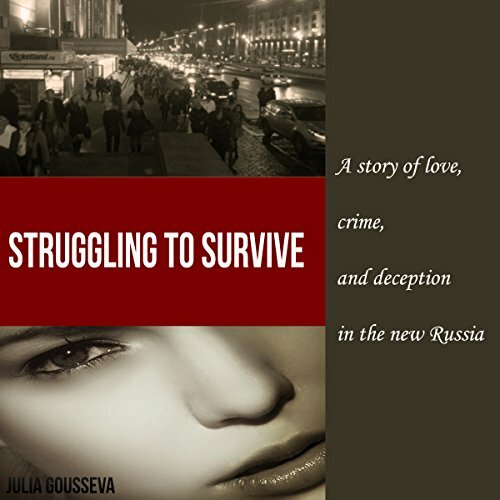 She returns to Moscow, but rebuilding her life is unexpectedly hard. It's the 1990s, and Moscow is undergoing dramatic social and economic changes. The old ways of living and making money don't work. Anya has to find new ways to survive, and fast. Her new life takes Anya from Moscow to Poland to Beijing, with dramatic experiences and encounters with violent crime, deceit, and corruption. Anya is focused on survival and raising her baby. Then the unexpected happens. Yes, the story was very touching and a fun listen. I enjoyed the characters and plot very much. What about Dawn Adkins’s performance did you like? "This review copy audiobook was provided by the author, narrator, or publisher at no cost." an interesting story that touched me. What did you love best about Struggling to Survive? the friendships and helpfulness between friends. How unpredictable it was sometimes. Which character – as performed by Dawn Adkins – was your favorite? A happy ending for Anya! Interesting historical fiction, with a lot of details about life in Russia in the 1990's. In this book, Anya is back to Moscow, and her life gets even more difficult before the first glimpses on happiness appear on her horizon. We were glad to see a happier ending to this part of her story. Dawn Adkins did a great job narrating this book. Would you consider the audio edition of Struggling to Survive to be better than the print version? What does Dawn Adkins bring to the story that you wouldn’t experience if you just read the book? If you could rename Struggling to Survive, what would you call it? I loved this sequel to Anya's Story. The ending of the first book was a little heart-breaking, and I was glad to see that things got better for Anya in this sequel. Dawn Adkins did a great job narrating both books.